Recently, the tech giant Microsoft has unveiled its new extraordinary patent, in which the tech giant Microsoft shows and demonstrated that how Microsoft wants to deploy all its ambitious innovations simply to make users live more handy, as it wants to put Fingerprint Sensor in keyboard keys. In the last few weeks, we are talking a lot about everything related to biometrics, in their different formats and operating methods, all as part of a secure system of alternative access to the passwords and keys that we have been using the last years. All this is something that has acquired a special relevance especially these last weeks after the presentation of the most recent handset iPhone of Apple, with the Face ID that has been implemented in the new iPhone X that commemorates the 10 years of the popular smartphone. For many of these security systems based on biometrics are the future, others still have much to improve to become real alternatives to the conventional passwords that we all use. However, there is no doubt that readers of fingerprints, iris or facial recognition are the future in this regard, something that the signatures are fully aware and that they are already beginning to implement. The tech giant Microsoft is one of them, as recently, we just discovered a new patent acquired that tells us that those in Redmond want to implement a fingerprint sensor on the keys of keyboards. Although we have been talking about Windows Hello and its face recognition system for some time, many people believe that this still has certain shortcomings and sometimes works inefficiently. 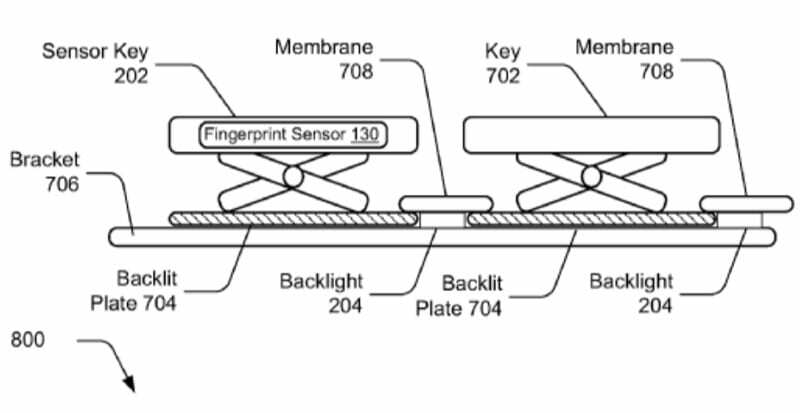 So with the new patent called “Keyset Fingerprint Sensor“, the tech giant Microsoft could be working to integrate a fingerprint sensor into the keys of our keyboards. This fingerprint recognition can be accomplished with the help of ultrasonic imaging technology working beyond 500 microns to correct some current drawbacks related to these sensors. For example, today manufacturers have to create a component that works separately to include fingerprint sensors in PCs, which is a bit cumbersome. In fact, these can usually be connected through a USB port of the computer, although they are somewhat difficult to manage for users. However, what the tech giant Microsoft intends is that this security system already comes included in an element as usual as the keyboard of our computers, therefore much more comfortable and versatile system for everyone, both manufacturers, and users.